Dynamite on stage, gnomic and unassuming in the flesh, Tennessee-born Chesney has been slowly and steadily crafting his career for nearly fifteen years. But it wasn't until 2002's triple platinum No Shoes, No Shirt, No Problems album that he really hit the big time. Tickets for the accompanying Margaritas 'n' Senoritas tour were snapped up hungrily by those looking for the energetic, glitter cannon-filled entertainment you get from by older showmen such as Brooks & Dunn and Garth Brooks, combined with a style of reassuringly masculine country picked up from Tim McGraw and Alan Jackson. 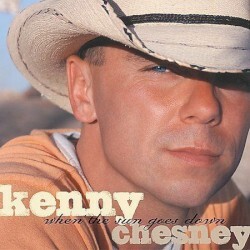 Chesney co-produces the album with long-time producer (and Reba McEntire favourite), Buddy Cannon. Apart from the title track, a duet with Detroit rap DJ Uncle Kracker (don't worry, it's more Jimmy Buffett than Kid Rock), it is very much Chesney's show. He even gets a few songwriting credits - you've got to pay for that yacht in the Caribbean somehow - on ''Being Drunk's A Lot Like Loving You'', ''I Go Back'', ''Old Blue Chair'' and ''Keg In The Closet''. That very American brand of nostalgia runs through these songs, which means that back home he'll get undeserved leniency for opening lines like: ''We had a dog named Bocephus in the front yard, he liked sleeping out on top of the car''. The excitement of his live shows is captured in the three bonus tracks at the end. Two older numbers, ''Live Those Songs'' and ''What I Need To Do'' are followed by ''Please Come To Boston'', originally a hit for Dave Loggins in 1974 and later covered by Reba, Joan Baez and Willie Nelson. The contrasting lack of recognition for this song and the high pitch screams suggest that he's playing to a youthful audience; a positive sign that country music still means something to the Britney generation.